The CEO of Trials developer RedLynx has admitted that the company posted the game on torrents. 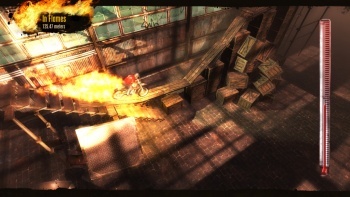 In an apparent effort to curtail piracy by contributing to it, RedLynx CEO, Tero Virtala, said that his company leaked a version of the motorcycle game, Trials, on the same day that the game was released. The only difference was that the leaked version did not have access to the online leaderboards, which Virtala claims is the "soul" of the game. "Piracy is here, so how can we take advantage of that?" Virtala said yesterday during a panel at Develop Liverpool. It was his hope that pirates would download the game, and then become so enthralled with it that they would then go out and buy the full version. Right, pirates are suddenly going to transform into paying customers because the "soul" isn't there. In my mind, posting even a gimped version of your game to pirate sites is counterproductive to attempting to earn money developing said games. Doing so implies that piracy is tolerable, which it isn't. Plus, any traffic which the game may or may not generate to such torrent sites may facilitate users downloading other pirate games which legitimate companies did not leak. Even if RedLynx made the unscrupulous decision to post their game to a torrent sites, why in the name of Jehovah would the CEO tell anyone about it? I see no advantage for that information to be made public and, conversely, there is a huge possibility for an industry-wide backlash. Maybe Tero Virtala drank a little too much coffee and Red Bull before his panel? Or maybe a software pirate killed the real Tero Virtala, created a life-like Tero Virtala cyborg, and inserted him into the panel at Develop Liverpool unbeknownst its organizers? I leave that up for the gaming community to decide. And finally, Tero Virtala! Best. Name. Ever.